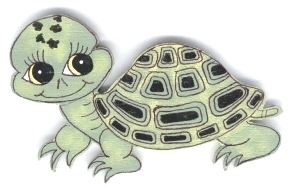 For the Cutest little Turtle Pin Cushion this is one of our newest additions!! A fun Turtle for just about anyone. They measure about 7 inches long from head to tail, and about 4 inches wide and 3 1/2 inches tall. These little Turtle Hatchlings are Hand made of solid wood (Poplar) with a 4 inch wide cushioned fabric top. These little turtles can be used as pin cushions, paper weights or whatever you can think of!! If you have a favorite fabric you want to use, let us know and we can make it happen. for purchasing more than one Turtle Pin Cushion. Thank you! !